Kasapreko Company Limited, Ghanaian firm known for its famous Alomo Bitters has unveiled a new state-of-the-art manufacturing plant in Ghana at a cost of $70m. The new factory is said to be equipped with modern machinery that would enable the company migrate to a total beverage enterprise. It is said to be equipped with high speed spirit production lines that can produce 70,000 glass and PET bottles per hour and two additional installed lines capable of producing 40,000 bottles of water and non-alcoholic drinks per hour. Speaking at the opening ceremony, the Group Chairman and Founder of Kasapreko, Dr. Kwabena Adjei, was quoted as saying that Kasapreko started with just five staff and now has over 600 people in its workforce. He said that Kasapreko has transformed from an alcoholics company to a total beverage company with innovation leading its growth, backed by research to satisfy changing consumer needs. “The company has always been guided by strong values and the 3 M’s – Quality Material, Manpower and Machinery,” Adjei noted. The event which was graced by the President of Ghana, Mr. John Dramani Mahama, also had industry stakeholders in attendance. The President was said to have commended the Kasapreko Company for the good image it has brought the country. “Two weeks ago, I launched the ‘Made in Ghana’ campaign to encourage Ghanaians to patronize our local made products and invest in them. My first encounter with Kasapreko was in 2000, but now the brand is a household name in Africa and beyond. The government is ever ready to back Kasapreko and provide all the support they need to grow, “Mahama added. On a further tour of the facility, the president noted that he was more impressed with the state-of-the-art facilities and this will serve as an example and motivation to other investors. He was further quoted as saying: “No country is built on commerce and trading alone. “It is manufacturing, agriculture and agro-processing that will change the structure of this economy and make our country rub shoulders with the big names in this world. The company also unveiled a new look for its flagship brand, Alomo Bitters. The product now comes in a sleek bottle with an already existing hologram security seal, a step seen by many as a major innovation drive for the product. Speaking on the unveiling, Chief Executive Officer of Kasapreko, Mr. Richard Adjei, said: “It is in this spirit that we have renovated our flagship brand, Alomo bitters by giving it a bold new look and standard befitting of an international brand whilst maintaining its authentic liquid that its renowned for,” he said. 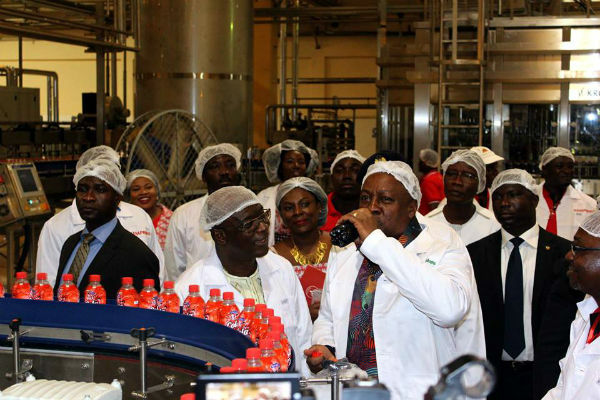 He also added that all was set for the company to commence production of the new water brand, Awake Mineral Drinking Water, carbonated soft drinks and juices. Kasapreko Company Limited is the leading beverage manufacturer in Ghana with products that have sold worldwide under a variety of brands in the bitters, whiskey, gin, liqueur, brandy and wine drink categories.